Leather Aviator jacket is the old player and still holds higher style value. With the days and experiment, the fashion world has introduced some different types of leather aviator jackets to our winter wardrobe. And all of them hold the undeniable stunning appeal. A pared-back version of the leather jacket in Navy color should hold the top place in your preference list. Without any doubt, it is the best and easiest form of a leather aviator to wear in these days. Here you can enjoy slimmer body with no zipped pockets; for a casual day out you can pair it with selvedge denim, tracksuit bottoms, wide-leg chinos or tailored trousers. The choice is yours! Previously these jackets were not of real leather. But nowadays, the leather experts are also engaging the royal navy color in their regime too. And that’s why getting the navy leather aviator jacket is no more a hard job. Yes, it is true that leather is a timeless fashion though you need to be careful to buy a leather jacket. It has been noticed that a lot of people pick the wrong one and that’s why you need to be more careful and aim for a quality hide that will simply get better with age along with the fit which is slim but not restricting. This kind of jacket is dating since WWII time and people still are in love with it. You just cannot deny its unbelievable warmth capacity and instant appearance changing virtue. No matter where you are going, a leather aviator jacket can accompany you always without compromising the style value. Along with this, the leather offers great insulator effects. In other words, it can be said if you go to a warm place from the too cold place then the bomber jacket will not make you uncomfortable (you will not feel burning inside after getting in a comparatively warm place). In the previous days, bomber jackets were without any fur collar. But later after, people started to wear a combination of leather and fur in a great way. 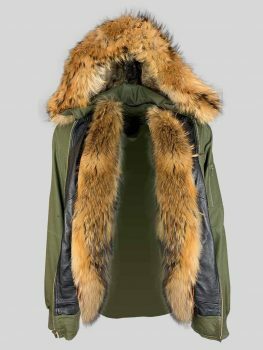 But nowadays, leather jackets with fur collar are trending options. 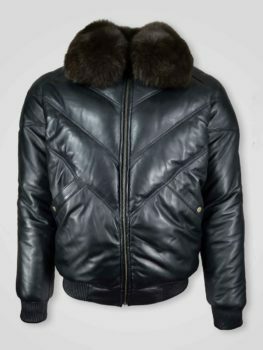 Stylish fur or fur trim collar is with the aviator jackets nowadays to ensure adding warmth, cold protection, and style. These jackets are gaining popularity since the Second World War time. These jackets are able to provide exceptional warmth to aircrew that sometimes flew at altitudes above 30,000 feet. The crimp of sheepskin creates insulating air spaces and allows the jacket to retain the body heat even during winter’s worst. Along with this, it has breathable properties which keep the wearer fresh for a long day. The high price tag may lead you towards dilemma. The high price tag makes the buyers feel reluctant to invest in the jackets. But the durability, these jackets come with really deserves the investment. If you properly take care of the jackets then they can accompany you for decades. Even Alen Cooper continuously hears back from the clients who have been wearing the leather jackets for years and it is still in proper shape. Generally, sheepskin is naturally water resistant. The fibers in the jacket contain sturdy water repellent layer and it prevents water from reaching inside the core. Without getting dump, these cores can absorb moist vapor. With the humidity absorbing and water repellent ability, sheepskin acts like a thermal regulating material. In a wide variety of climates, it can keep you warm and dry perfectly. Its moisture-wicking feature helps to carry it anywhere without worrying about the weather. It can also wick away moisture from the wearer’s skin. In order to beat the too cold winter, there is no better alternative than the leather aviator jackets. This jacket is quite versatile too. Its advanced breathability and moisture-wicking properties help you to wear this jacket in spring too. No matter where you are going- for a light hike in spring or shoveling snow, this leather aviator jacket helps you to stay cool and dry. These are the ultimate benefits that you are going to enjoy with a stylish leather jacket. In order to avail a jacket with high style value and comfort, you can visit us both online and offline. Can you provide me a navy leather jacket?